Cardio Formula provides antioxidants and other heart-nourishing ingredients that help the body deliver nutrients to and carry wastes from all body cells. Derived from plants, these nutrients cleanse and tone the circulatory system to assist proper temperature balance. This formula also supplies botanicals that support capillary health, the liver and other purifying organs of the body. 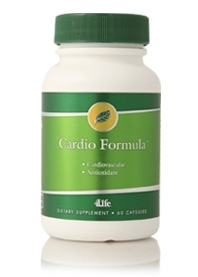 Cardio Formula provides a safe, all-natural formula to support circulatory system function. "My family has a history of varicose veins. My veins had become very painful and their appearance was bad. I began taking PBGS+, Cardio Formula and now 4Life Transfer Factor. I used to have to wear very firm support hose but not any more, thanks to 4Life." "After taking Gurmar, Catalyst Formula and Cardio Formula for six weeks I had a check-up with my doctor. My blood pressure, blood sugar and weight had decreased. It is the best report I have had in 8 years. My doctor is still not a believer, but he said that if I think the products are helping I should keep taking the them. If in three months my health continues to improve, he might give the products some credit. We will show him!"